Behind every improvement technique and tool there is a winning spirit. There is no downside to the ideas that processes can always be made better and that positive change is everyone’s business. But today we’re going to focus on one common improvement tool, the idea board, and make the case that there’s a better way. After all, why wouldn’t the force of Kaizen be applied to improvement itself? Let us begin by saying that there is a lot we love about idea boards. Whether they are just a simple space where notes with employee ideas are randomly affixed or a more organized board with status indicators or categories, there are a few things they get right. Idea boards are very democratic, giving everyone the opportunity to make suggestions within and beyond the scope of their every day jobs. Does a customer service representative have an idea about how to improve safety in the office? Great! They can share it on the idea board for the facilities team to see. The best ideas can come from anywhere, and there’s a good chance that people already have a notion of how to handle your toughest challenges, so bring it on. Sometimes people are reluctant to bring up opportunities for improvement in meetings unless they come along with fully formed plans. Why? Because in a meeting, they will instantly be asked questions and will likely be presented with a list of reasons that change is impossible. Idea boards relieve that pressure. It’s “just an idea” after all, so what’s the harm of popping it on the board? The worst ideas are those that your employees have, but never share. It doesn’t take a degree in statistics to walk past an idea board and get an idea of how engaged teams are in improvement. If you put up an idea board and get crickets, you’ve either have no problems at all, or more likely, a big engagement problem. If yours is covered with suggestions, you may have many problems, but you’ve also got folks who would like to see them solved and that’s a good place to be. If you don’t mind, please take a quick minute and do a Google images search for “Idea Boards.” We’ll wait. What you saw if you did the search (or can imagine, if you didn’t) is a lot of sticky notes. Some are randomly scattered, others more organized, but the majority of idea boards involve sticky notes or index cards affixed to a poster, wall, or whiteboard. Let’s think about that for a minute. It can be argued that your employee ideas are the most valuable asset of your company. Do they belong on sticky notes? What does the disposable nature of sticky notes and index cards say about the importance of improvement work? Would you put your best idea on a Post-it? Physical cards, especially sticky notes, can be accidentally separated from the board, lost or damaged. The board is a great way for collecting ideas, but not a useful mechanism for supporting the work to get them implemented. Once an idea is intentionally removed from the board, perhaps because it has been implemented or rejected, no record of the associated work or thought processes remains. The same rejected ideas could repeatedly return because no one knows why they were removed. Successful process improvements are less likely to be duplicated because there is no documented roadmap. You need to be physically present at the board to see it or to add ideas to it. People may have ideas while they are not in the vicinity and forget to add them. Leaders have no easy way to assess the organization’s engagement with improvement. Idea boards do not cover one of the most important steps in improvement, impact measurement. How many ideas were implemented? How did they affect financial, quality, safety and satisfaction measurements? Who is contributing the most impactful opportunities for improvement? The idea board gives you none of this information. It would be pretty harsh to throw cold water all over the concept of idea boards without offering a better way. Fortunately, continuous improvement software has been developed that gives you all the advantages of idea boards with many more capabilities and benefits. Like idea boards, the best solutions invite employees at every level to contribute suggestions for positive change. They don’t involve prior restraint and offer easy visual management of engagement and progress. Unlike idea boards, they form a permanent repository of knowledge around every idea and improvement effort. They come equipped with notifications and task alerts that ensure improvement projects reach the finish line. They are accessible from anywhere, on any device and they allow managers to track the health of improvement across the entire organization. And finally, they provide a method for measuring the success of each improvement over time and make it easy to recognize and reward your top performers. If you are doing anything to gather opportunities for improvement, good for you! Consider taking it to the next level with technology designed to accelerate the momentum of improvement. 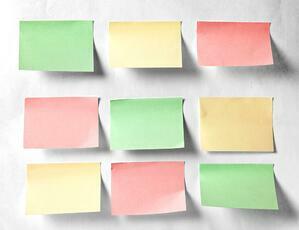 Sticky notes are great for grocery lists and reminders, but we’ve found that employee ideas deserve something more. P.S. This is ironic given the subject of this blog, but did you know that the Post-it note was an employee idea? Read more about how 3M almost lost it's billion dollar product.